My name is Vina, and I am the blogger behind The Bouquineuse. 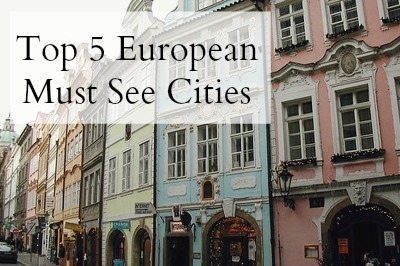 In honor of Sarah's trip, I decided to write about my top 5 must-see European cities for anyone who loves to travel, or just loves hearing about cool foreign places! I've included some tips and a few of my favorite tourist spots. Paris. Where do I even begin? If it is possible to be in love with a city, then I am completely enamored with this one. The language is beautifully romantic, the city layout is perfection, the food is unique and delicious (macarons anyone? ), and the fashion is in a league of its own. My advice? Take one to two days to visit all of the major tourist attractions, and after that just soak in the city. Sit in outdoor cafes, stroll down cobblestone streets, and explore museums. Paris has tons to offer, but make sure you save time for the artist's district by Montmartre; you won't regret it! London. Despite the gray skies and frequent rainy weather, London is a must-see on any avid traveller's list. The history is part of what gives this gorgeous city so much character. The architecture is beyond fabulous and it is fascinating to see the differences between the older and more modern parts of town. The London Dungeons was probably my favorite childhood tourist attraction. Sorrento. The charm, the serenity, the ocean breeze... Anyone having wanderlust yet? Sorrento is a deliciously tucked away slice of Italy. While many tourists flock to larger metropolitan areas like Rome, Sorrento is frequently overlooked. My fondest memories of Italy are not from Rome, but from balmy evenings on hotel rooftops in Sorrento overlooking the Mediterranean, as I ate gelato by the scoop and chatted for hours with my friends. Nice. Back to France. The French Riviera is breathtaking, and this city has a little piece of everything. Friendly people, yummy food, lively street performances, sun-soaked beaches, and an overall happy atmosphere! The nighttime outdoor markets were my favorite; testing out your French while bargaining with the vendors is always a funny experience. I would definitely go back if I have the chance! Edinburgh is a most - for history and gorgeous views - I actually prefer Edinburgh to London! Sorrento was one of my favorite places I visited in Italy! I loved the entire Amalfi Coast-- but Siena was another one of my favorite cities I would love to visit again! I don't think you can narrow the best places in Europe down to just five.